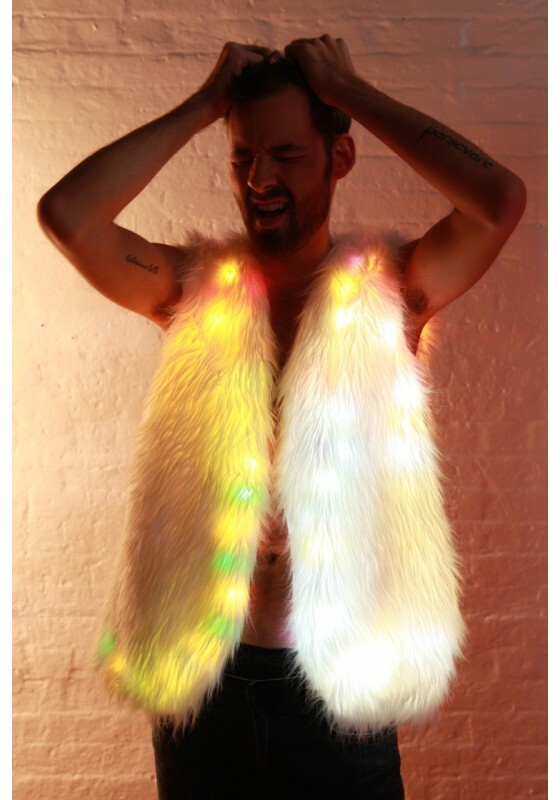 Super fluffy white faux fur vest is packed with rainbow LED lights that change colors! Your vest will cycle through tons of different patterns including light-up rainbow, strobe, & fade between colors. Vest features a comfortable light weight lining & secret inside zipper stash pocket for the battery pack. 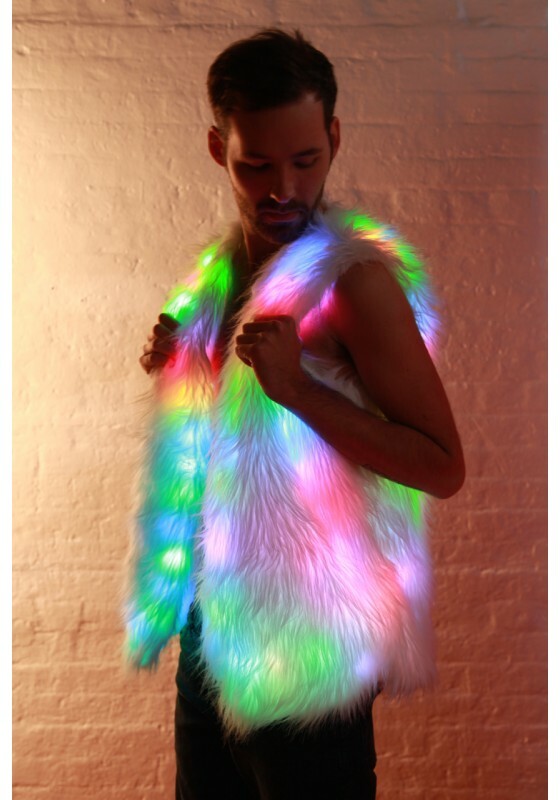 Light-up fur is the perfect accessory for events. Takes replaceable AA batteries, usually lasts up to 48 hours on new batteries to keep you dancing all night! 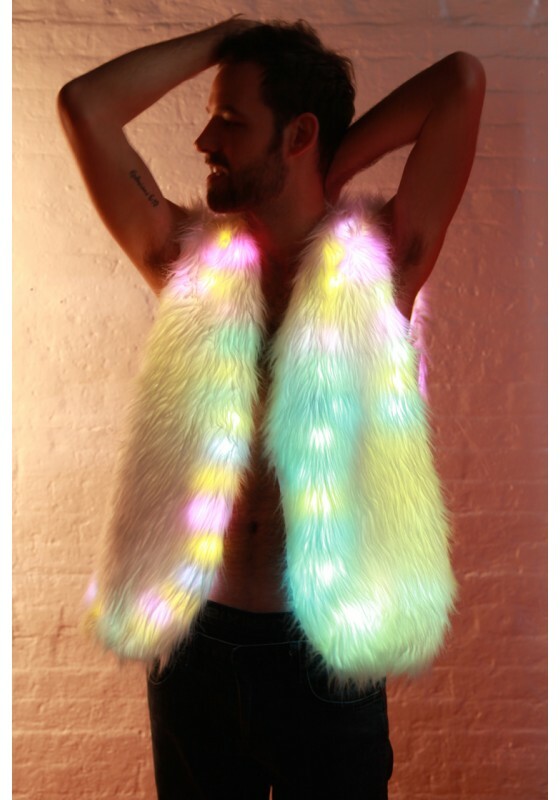 Super fluffy white faux fur vest is packed with rainbow LED lights that change colors! Your vest will cycle through tons of different patterns including light-up rainbow, strobe, & fade between colors. Vest features a comfortable lightweight lining & secret inside zipper stash pocket for the battery pack. Light-up fur is the perfect accessory for events. Takes replaceable AA batteries, usually lasts up to 48 hours on new batteries to keep you dancing all night! so you can dance the night away hands-free! All of our products come with a 30-day warranty. If for any reason your item breaks due to normal wear, we will replace it within 30 days of purchase. Items are in stock & ready to ship. Standard shipping takes 2-5 business days. Need it faster? We offer express & overnight service too. Pre-Order items take 1-3 weeks. © Neon Nancy, All rights reserved.